Stormwater runoff that enters a storm sewer system is being routed to some type of treatment process before entering our surface waters. Not true! In almost every case there is no pre-treatment of stormwater! Storm sewer systems are designed simply to capture the stormwater and carry it to the nearest surface water carrying pollutants into our rivers, lakes and streams! Stormwater is the flow of water on the ground immediately after precipitation - rain or snowmelt. After a rainfall, some of the precipitation is infiltrated into the soil, some of it is taken up by plants, and some is evaporated back into the atmosphere and the rest runs off land surfaces and other impervious areas. Unfortunately, the stormwater runoff picks up any oil, grease, chemicals, nutrients, metals, even bacteria as it travels across land. 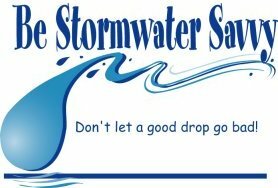 Heavy rainfall or snowmelt can cause sewer overflow, which will also be carried by the stormwater. All of these chemicals and pollutants will then enter our lakes, rivers, and streams. Stormwater is either drained into drainage systems which carry the water into rivers, lakes, or streams, or it is directly discharged into our waters. Stormwater runoff can have negative affects on our environment. When chemicals, oil, grease, salt, etc. are carried into our rivers, lakes, and streams, all of these bodies of water become polluted. Pollution of our water may not be immediate, but as the pollutants keep appearing and chemicals increase, our waters may become unusable for fishing, swimming, canoeing, etc. In some communities, even the drinking water can be affected. Does Development Affect Stormwater Runoff? It most certainly can. As development and imperviousness increases (due to construction of roads, buildings, parking lots), the infiltration ability of soil decreases. Consequently, more rainfall becomes stormwater runoff, which can cause erosion of land areas and stream banks or increased flooding. Storm water runoff occurs when precipitation from rain or snowmelt flows over the ground. Impervious surfaces like driveways, sidewalks, and streets prevent storm water from naturally soaking into the ground. Storm water can pick up debris, chemicals, dirt, and other pollutants and flow into a storm sewer system or directly to a lake, stream, river, wetland, or coastal water. Anything that enters a storm sewer system is discharged untreated into the water bodies we use for swimming, fishing, and providing drinking water. Polluted storm water runoff can have many adverse effects on plants, fish, animals, and people. Sediment can cloud the water and make it difficult or impossible for aquatic plants to grow. Sediment also can destroy aquatic habitats. Excess nutrients can cause algae blooms. When algae die, they sink to the bottom and decompose in a process that removes oxygen from the water. Fish and other aquatic organisms can’t exist in water with low dissolved oxygen levels. Bacteria and other pathogens can wash into swimming areas and create health hazards, often making beach closures necessary. Debris—plastic bags, six-pack rings, bottles, and cigarette butts—washed into water bodies can choke, suffocate, or disable aquatic life like ducks, fish, turtles, and birds. Household hazardous wastes like insecticides, pesticides, paint, solvents, used motor oil, and other auto fluids can poison aquatic life. Animals and people can become sick or die from eating diseased fish and shellfish or ingesting polluted water. Polluted storm water often affects drinking water sources. This, in turn, can affect human health and increase drinking water treatment costs. This article is part of a series of articles that will be passed along to our citizens over the next several years. It is our hope that with increased awareness we can work together to significantly reduce the amount of pollution entering the creeks and rivers in the Niles area.